Chick-fil-a gives free food to customers who dress up as cows on National Cow Appreciation Day. Break out the cow spots and cowbells. On Tuesday, Chick-fil-A restaurants nationwide are giving away free food from opening time until 7 p.m. for its 13th annual Cow Appreciation Day promotion. But there’s a catch: You have to dress up like a cow. 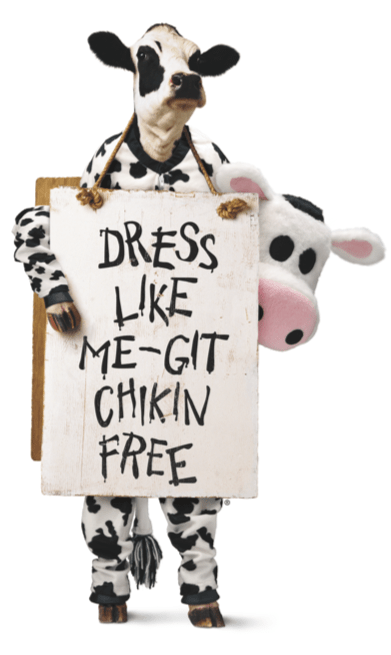 “Adult customers who dress in any type of cow attire, whether it’s “’head-to-hoof’” or sporting a cow-spotted accessory, will be rewarded with a free Chick-fil-A entrée,” the company announced. Children get a free kid’s meal for dressing up. Chick-fil-A, best known for its chicken sandwiches, has a long featured cows in its advertising. The running joke is that the cows are plugging Chick-fil-A as a way of preserving their own lives because customers will eat more chicken and less beef. Cow-clad customers have the choice of nearly every item on the Chick-fil-A menu except for salads. For breakfast, options include the Egg White Grill and Chicken, Egg and Cheese Bagel, Chick-n-Minis, Greek Yogurt Parfait or any size fruit cup. For lunch and dinner, choose from the seasonal Smokehouse BBQ Bacon Sandwich, Chicken Deluxe Sandwich, Grilled Chicken Cool Wrap, other sandwiches, nuggets, and drinks including small frosted coffee and small frosted lemonade. Expect long lines and crowds of chicken lovers for the annual event.